Wednesday was the first really nice day without rain in a long time so Rich decided that we would turn Took and little Asteri (officially Asteri Athena, named by grandson, Max) out into the "nursery" pasture. Followed closely by her mother, Asteri took her first tentative steps out into the sunshine and lush green grass. She looked around curiously and timidly took a few more steps, when suddenly she seemed to sense the freedom and attempted her first official pronk. This is a maneuver in which the animal suddenly leaps up with all four feet off the ground. Upon landing she wobbled a bit, steadied herself and took off at a trot to explore the remote corners of the new environment. Of course she was so fast and I was so enthralled watching her that I did not get a good picture of this dash for freedom. For this first venture out into the world of the pasture her mama followed closely behind. The rest of out little herd gathered at the adjoining fence to watch the new little girl as she explored the pasture. They have repeated this behavior every day since and seem to be very interested in all of her actions. Her big sister, Mango, is probably the most curious of all the animals. I'm sure she wonders about this little one who is keeping her separated from mama. Thursday we woke up to a pretty dense fog which gave the pasture a veiled look. I found myself in the early morning hours, standing out in the barnyard in my pj's snapping dreamy pictures of Asteri and Took. During the first minutes after waking Asteri and Took relieve themselves in the pasture and then all the little one is really interested in is breakfast! Of course, over the last week I have taken over a hundred pictures of little Asteri to record her progress. Since the vet pronounced her a perfectly, formed and healthy little cria last Sunday, she has put on approximately a pound a day, which is what the experts in our books and on the websites say is to be expected. Today when we weighed her, she was 21 pounds. She gets stronger every day and is particularly fond of running and pronking through the pasture. Asteri randomly pronks and runs through the pasture and after an extended spurt of energetic playing we often find her napping in the sunshine. Of course, mama Took is always grazing or napping close by. Rich and I have spent a lot of time in the pasture lately; only some of it working on chores and projects. It is so fascinating to see how the herd members are reacting to the new addition; and of course, Asteri is growing and learning so rapidly that we don't want to miss a minute of her development. Soon we will have another little one join Asteri and Took in the nursery pasture since our beautiful black Firenze is due in September. It should be really fun to watch two little crias pronking together in the pasture this fall! We have also enjoyed having Pressley around to work with Leezza and Mango in preparation for the fair. That will be coming to an end with this morning's work out session since the fair begins Monday. Rich and I will deliver the two animals to the fairgrounds tomorrow morning and will also be on hand to watch the show Monday night. We also plan on attending the fair at least twice more during the week before we pick them up a week from Sunday. I will miss Pressley. 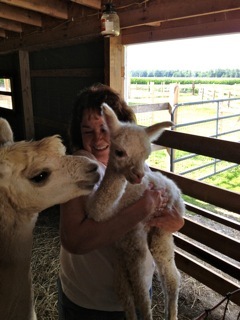 It has been as much fun being her "alpaca" teacher as it was being her English teacher! Rich and I have also enjoyed having so many of our friends stop over this week to see our new little addition to the herd. It's always fun to watch the awed and amused looks on their faces when they see our curious little Asteri, who often pokes her face right up in the camera when it's down on her level. And I like that our friends take pictures and forward the good ones to me. I will end today's blog with another picture from my friend, Rosalie.